For the Provincial Concours Schedule, click here! 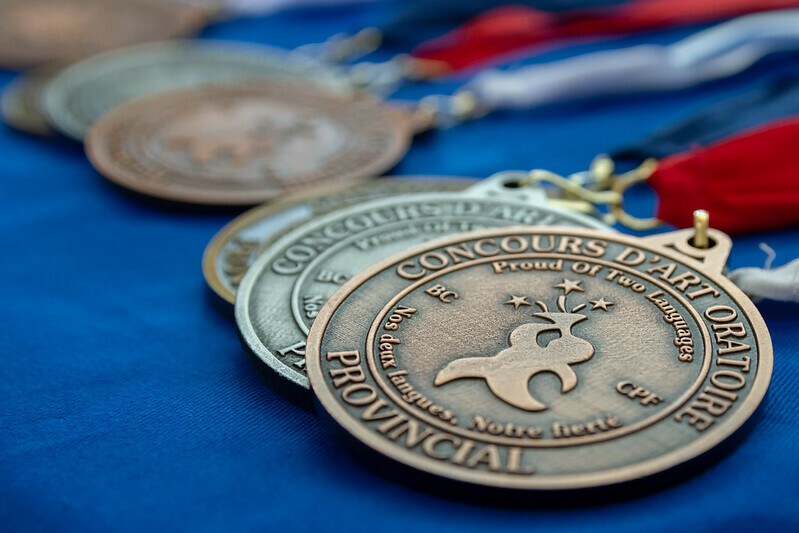 CPF’s Concours d’art oratoire is Canada’s largest, annual French-language public-speaking competition, involving close to 10,000 students every year, and thousands of dollars worth of prizes. The aim of this public speaking contest is to stimulate the interest of students learning French, to improve their speaking skills, and to give them experience presenting in public. This event is organized by Canadian Parents for French (CPF), who has worked together with parents and school staff since 1983 to organize school, district and provincial-level competitions. Concours is open to French Second Language (FSL) and Francophone students from grades 6 through 12 who are studying Core (Basic) or Intensive French, French immersion (Early or Late), or studying in a BC Francophone school (Conseil scolaire francophone). Thousands of students compete at the school and district levels, and last year, almost 300 winners traveled to the new Surrey campus of Simon Fraser University for the provincial finals where they competed in a one-day event in their specific category. First place winners in grade 12 then went on to compete at the national finals in Gatineau, Quebec, across from Ottawa. This year the national finals will again take place in Gatineau. Different categories are set out for students in French Immersion, Core French, and Francophone students. The speeches are judged by French-speaking volunteers: from university and college professors, to teachers and native Francophones, and even French immersion graduates, many of whom have themselves competed in Concours. For full details on resources, registration and general information, check out our “How-to Concours” guide! The Provincial Concours d’art oratoire runs so well every year thanks to dozens of volunteers and judges. For information on the roles and responsibilities of volunteers and judges, click here. As soon as a student has won a regional competition, the student must register for the provincial finals and pay a nominal $15 registration. A student’s school must also hold a CPF membership in order to register a student in the provincial competition. This document indicates current membership standing for schools in B.C. Red indicates that the school’s membership will expire before Concours 2019. If a school is not highlighted, its membership is confirmed and in good standing. If your school is not listed, it may be because your school does not have a CPF Membership. In this case, please contact our Outreach Manager Rowan Burdge at [email protected]. Unsure of what category to register your student in? Click here for help! The registration deadline is strictly enforced and no late registrations will be accepted. The CPF BC & Yukon office must be notified of any conflicts* prior to the competition. copied directly to the schedule. Please make all possible efforts to ensure the information is correct. $15/student. Districts can register multiple students at once (only 1 per category). For more information, refer to our “How-to Concours” guide. Looking for more info? Have questions? Please contact Concours organizers Patti and Robin Holm at [email protected]! Looking to sponsor Concours? We’re now accepting financial and judges sponsorships for this year’s event. Check out our Sponsorship Document for details.